Jazz Community Site - Jazz Team Blog » Independent research firm ranks us highest among all vendors in Current Offering for ALM Tools! 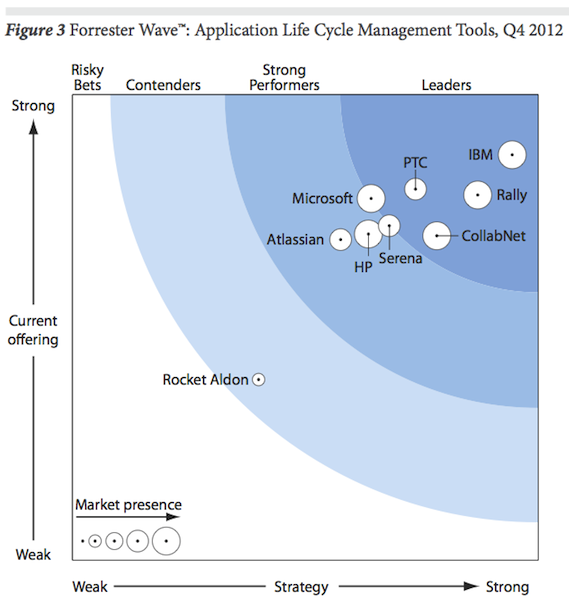 I’ve just found out that Forrester Research, Inc has ranked IBM as achieving the highest scores in both Current Offering and Strategy for Application Lifecycle Management tools among all vendors in the Forrester Wave™: Application Life-Cycle Management, Q4 2012 report! Forrester conducted lab-based evaluations in 2011 and interviewed nine of the most significant software providers. The IBM evaluation was based on the IBM Rational CLM solution: Rational Team Concert, Rational Quality Manager, and Rational Requirements Composer. According to Forrester: “IBM’s position in this year’s assessment of the ALM market is a testament to an important principle: It’s not enough just to have good products — the products, in combination, must support common activities in software development and delivery.” Forrester goes on to say that not only have we continued development of our strong suite of products, but we have “also stitched them together in a more coherent way” and “made clearer the use cases we support … such as Agile teams and embedded software development.” Well, at least we stitched them together! How many products does it take to make an ALM solution anyway :-) Read the report and find out! But kidding aside, we are thrilled and humbled that Forrester is recognizing us this way, and we couldn’t have done it without the contributions and participation from all our customers and community at jazz.net! From all of us on the Jazz Team… thank you! Up to the next step… getting customers to accept ALM solutions over (self-made integrations of) point-solutions.